This our smallest cottage with no steps or stairs has a wealth of oak beams. It has 1 double bedroom with an en suite shower room and wc. The cottage has an open plan diner/kitchen/lounge with an additional double sofa bed. The kitchen is equipped for 4 people and includes an electric hob, oven, fridge/freezer, dishwasher, microwave, coffee maker, kettle and toaster. There are electric heaters for the cooler months and in the lounge satellite tv, (English and French). There is a hair dryer in the shower room and an iron and ironing board is provided. There is a separate laundry room with a washing machine available for the use of guests. The private terrace is provided with wooden tables, chairs, parasol and a barbeque. We were looking for a quiet week in rural France away from city life in the UK. On arrival we received a welcome pack of essential goodies to start the week, including of course some wine, we thought this a nice touch. La Logerie is set in a beautiful part of France and the site has a beautiful pool and hot tub, what a lovely way to round off a days site seeing with a nice glass of French wine. Gill and Brian are lovely hosts and made us feel very welcome, thanks folks for a great week. Thanks so much for your lovely review. We are so pleased that you enjoyed your holiday and all that La Logerie and our beautiful part of France has to offer. Hope to see you again next year. Great country gite to recharge the batteries. Very hospital hosts who provided a lovely welcome pack including eggs from their own chickens. 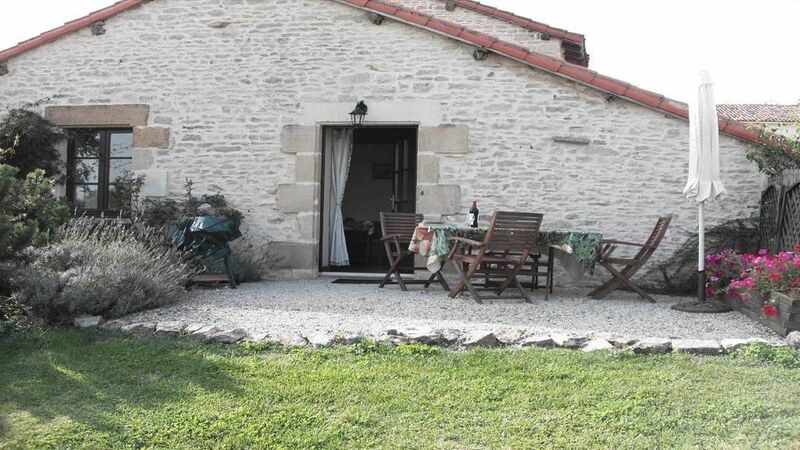 Beautifully converted farm buildings, very clean and comfortable. Lots of supermarkets nearby. Picturesque places to visit such as Isle de Jourdan, Confolens, St Junien, Civray & Charroux. Even found a quaint cafe bar in Beneste whilst venturing around the country roads. Fabulous pool to cool off in, table tennis in the shade or even badminton when you can bear the heat and tennis in the local village. Clean cosy and comfortable with all you need to hand. Thanks so much for your lovely review. We are so pleased you enjoyed your holiday here and our facilities. It was a pleasure having you stay and we hope to welcome you back again sometime soon. Thanks so much for your lovely review. We are delighted that you enjoyed your holiday here and hopefully look forward to seeing you again soon. We were completely satisfied with Lavender Cottage near Mauprevoir. The facilities in and around the cottage were complete and the patio was perfect for breakfasts in the sun and dinners after we had been site-seeing all day and after a swim in the pool. Gill added her lavender touches to the cottage and Brian provided some local history. The area is excellent for country walks, interesting towns and supermarket shopping. We would love to return someday and we would recommend it to anyone. Ed and Judith Harrington, Vancouver, Canada. Thank you so much for your lovely review. It was an absolute pleasure having you stay and we look forward to hopefully welcoming you back again in the not too distant future. At lavender cottage you wake in the morning to the sunrise as you have breakfast on the terrace, after a comfortable nights sleep. The cottage and everything in it so clean and just perfect. The welcome package on arrival is the best we have had in the last ten years of travelling in France. After an early evening swim in the glorious beautifully maintained pool, you can relax watching the very kind and friendly owners, Brian & Gill feed their animals down in the paddocks from lavender cottages terrace with a glass of wine as the sun goes down. What a perfect end to a day!!!!!!!!!!!!!!! What a wonderful review! Thank you so much. We agree 100%, the sunrise and sunset here just can't be beaten and even more so in the evening with a glass or two of wine. You were lovely guests to have around and we are delighted that you enjoyed your holiday here and everything that Lavender cottage and La Logerie has to offer. We look forward to being able to welcome you again soon! This was one of the best holidays we have had. La Logerie is a fantastic place, picturesque surroundings with great facilities. We were given a warm welcome on arrival by Brian and Gill who are so friendly and helpful. The welcome pack of wine, bread, cheese etc was a wonderful touch which was very welcome after a long drive then a dip in the immaculate swimming pool was refreshing. The cottage was very clean and had literally everything you can want. The bed was very comfortable and the shower is great. There was a lovely patio with table, chairs and bbq which we tried out later with a glass of wine, the sun setting and Charles Trenet La Mer on ipad just wonderful! The was plenty to do for our young (8) daughter trampoline, badminton swimming, table tennis etc at La Logerie and she loved feeding the dwarf goats with Gill and playing with the cat. There is a big hot tub which again was great after a hard days eating and sightseeing. There are plenty of lovely little towns nearby to buy great fresh bread from and nose around the daily markets. Gill very kindly helped us book a table at their favorite restaurant in Charroux, amazing service and French food. There is a supermarket at Savigne 10 mins down the road, with the help of Brian's map, which has everything you need. I would and have recommended this place to everyone I know it is a gem of a find for a holiday and we are very much looking forward to coming back next year with our new arrival thank you Gill and Brian for a wonderful holiday. What can we say!!! Thank you so very much for the fantastic review and we are delighted that you enjoyed your holiday here so much. It was lovely having you stay and it is always a pleasure to help guests get the most out of their well earned holidays. Our dwarf sheep Brambles, Millie & Tiddly-pom want us to mention that they are a little miffed at being called goats but still want to thank you very much for the biscuits anyway. All the very best and we look forward to welcoming you back next year with your new arrival.